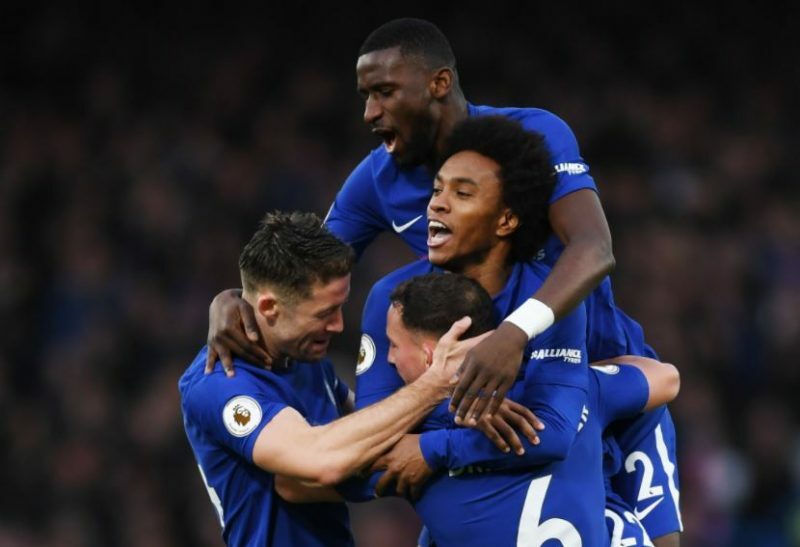 Chelsea put on a show as they comfrtably defeated Stoke City in the Blues’ final game of year 2017. Goals from summer signings Antonio Rudiger and Danny Drinkwater put the Blues 2-0 up inside just 10 minutes of play, before Pedro’s quality finish saw the hosts go three goals up before half-time. Two more strikes from Willian and Davide Zappacosta put the game to bed as Chelsea move up to second position in the league table, with Man United still a game in hand. Thibaut Courtois – 8 – There were around 43,000 people watching Chelsea against Stoke today, and on the first half Courtois really was just one of them. The Belgian had nothing to do until the second period, when he had to dive for a great stop from Saido Berahino’s one-on-one effort. Yet another clean-sheet to his name here. Cesar Azpilicueta – 8 – Great performance from the Spaniard, once again! Gary Cahill – 8 – Quality defending from the skipper, who’s really put in better and better performances lately. Antonio Rudiger – 8 – The German international was one of Chelsea’s most threatening players in the first half, as along with the opening goal, Rudiger made some crucial runs to cause huge havoc to the Stoke defence. Enjoyed a great game. Victor Moses – 7 – Earned the free-kick which led to Chelsea’s opening goal, and looked very composed throughout the game. Replaced by Zappacosta on the 55th minute as the Nigerian was given a bit more rest ahead of Chelsea’s visit to the Emirates next Wednesday. N’Golo Kante – 7 – A key figure in the middle of the park, as usual. Great defending and he surely enjoyed playing alongside his former Leicester team-mate Drinkwater. Danny Drinkwater – 9 – What. A. Goal. The Englishman marked his first Chelsea goal with an astonishing half-volley, and really took his chance when given one. Played a great game overall, and it really looks like he’s settling in well here. His long balls over the top were also brilliant to watch. Putting quite the pressure on Cesc Fabregas now..? Willian – 9 – MOTM – After a few not-so-great performances, the Brazilian really stepped up for his chance and made his mark with two assists in the first half. Superb performance overall, and he really deserved his goal at the end as well. Man of the Match, 100 %. Alvaro Morata – 5 – Morata was quite far from convincing today, and really needs to improve his finishing. The former Real Madrid man had two superb opportunities to score, but despite all the time in the world, he struck both of those efforts straight at the keeper. Did OK when linking up with Pedro and Willian, but was the worst of the most. Missing his mate Eden, maybe? Pedro – 8 – Enjoyed a fantastic game today. Assisted Drinkwater’s strike before finding the net by himself, and could have had a few more if it wasn’t for Stoke keeper Jack Butland’s quick reflexes. Hopefully he can retain his form. Davide Zappacosta – 7 – Showed off some neat dribbling on the right-hand side and lifted the fans from their seats once more with a stunning goal five minutes before the end of the game. Very good cameo from the Italian. Tiemoue Bakayoko – 6 – Did well stepping in for Kante in midfield. Didn’t have much to operate with. Michy Batshuayi – 6 – He might have played just over 15 minutes today, but truthfully speaking he did just as much as Morata for the team. Had a shot from long way out driven well wide from goal.